Optimizing your bike position, equipment, and setup is free speed. Not monetarily free, but free as in you’ll go faster without an increase in form or fitness. Triathlon’s sequence of events sees that as the you go from swim to bike to run, the resistive forces (water, fast moving air, slow moving air) that inhibit forward motion decrease. As an athlete, looking to dose your energy across an 8-17 hour day, throwing your effort into the wind is not a great use of that energy. In this installment, since most athletes spend at least half of their race duration working against fast moving air, I’m going to focus on the bike. Aerodynamics and equipment optimization continues to be a polarizing topic. Some embrace it while others try and pass it off as a fallacy. Athletes who continue to ignore the science put themselves at a material disadvantage. If I take two of the SAME athlete and optimize one and not the other, for a given effort, you can’t argue that one will not cover the course faster than the other. An athlete needs to check all the boxes. Buying a set of fast tires doesn’t mean you can take the week off from training. But if you’re serious about improving your performance, you will go faster without an increase in fitness by optimizing your bike position, equipment, and setup. Next is power. To me, power is the ability to pedal the bike without restriction within a range of accepted biomechanical ranges. There are a lot of moving parts to this, but the goal is freedom of movement, not to increase or decrease power. Unless something was way out of norm with an athlete’s position, it’s difficult to objectively prove this. Aerodynamics is the last goal of the fit, but is often a result of the initial fit process. I’ve been to the wind tunnel and velodrome with a lot of athletes to look at aerodynamics. I’ve seldom changed an athlete’s bike position to chase a lower drag number. Most of the time the athlete’s bike position and posture has already been optimized to be as low as possible while maintaining comfort within their biomechanical profile. Typically, details such as arm position, elbow width, and hand height are the only tweaks I’ll make to the position. At the pro level, I believe there is a certain standard that must be met or you’re putting yourself at a disadvantage. There are still a lot of poor bike positions in the pro ranks and in my opinion, almost any excuse you can come up with as to why your position is unique is unacceptable with the resources that are available. 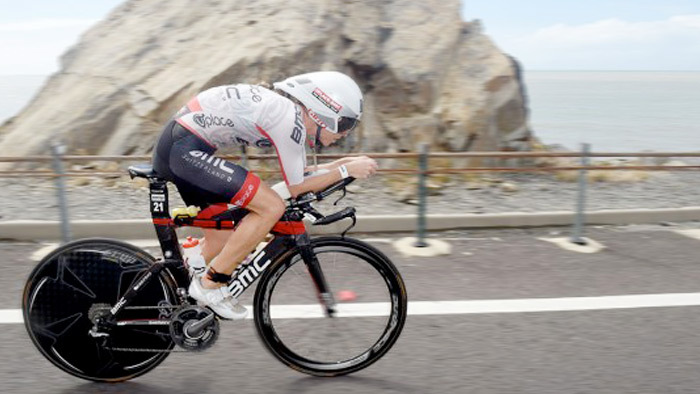 Liz Blatchford, coming from an ITU background, has only been riding a TT bike for a few years. She proclaims that she has always looked terrible on a road bike, but her rolled and rounded posture creates a great TT position. If I could make one change, it would be to extend her reach as I feel the cockpit can get a bit tight if she comes forward on the saddle. However, Liz is a bar chaser and will hold this arm angle regardless of how far out her bars move. Other athletes can be saddle chasers. No matter how far out you move their bars, they will stay put on the saddle and increase their arm angles. Callum’s position continues to improve. I made some adjustments this year to get Callum’s position is to get him the lengthen and relax his shoulders. This creates space for him to keep his head low, to improve his frontal surface area. If you add it all together, a bunch of small things equal one big thing. Almost every part of a bicycle can be optimized to move more efficiently by reducing aerodynamic drag, drivetrain friction, and rolling resistance. Typically, the bike frame is the first thing we think about. However, there are other lower cost methods to consider before upgrading your bike frame. Tires, tubes, wheels, cable routing, clothing, helmet, drivetrain maintenance, bearings, and most importantly…nutrition and tool storage. Long course triathlon can be a logistical nightmare. We need to carry “stuff” on our bikes. There are well thought out strategies that have minimal impact on aero drag and there are substandard methods that can turn your aero machine into a lunchbox on wheels. I’m also willing to make a few compromises with what I’d determine optimal setups to accommodate what is practical. For example, Liz prefers to place both her drink bottles on the frame. I don’t believe it’s the fastest bottle setup, but it’s faster than her drinking less because she can’t comfortably access her nutrition. Equipment selection and optimization can get tricky when working with professional athletes. There are a lot of companies that make high performing products and I prefer to focus on forming relationships with them. I’m admittedly difficult for athlete managers that are not of the same mindset. An athlete needs to consider if using an inferior product will cost you more money in the long run than if you had passed on the deal? Not all athletes are in a position to turn down any deal, but it’s something to consider. I’ve been happy with the choices that both Liz and Callum have made with their setups and sponsorship choices. There are a few minor tweaks I’d like to make, but at the end of the day, they are not breaking any major rules. I was able to use this display this on the biggest stage in triathlon in 2011. I was working with Craig Alexander who lost the 2010 race on the bike. Craig had always relied on his hard work and superior fitness to win the two previous years. However, for a competitor like Craig, failure forces change. He was all in when it came to optimizing his bike position and equipment. He would train harder than ever, but wanted to make sure he was getting the most speed out of his effort. In 2011, Craig showed up with a new attitude and had his equipment and bike position dialed. The result was his 3rd Kona title in which he broke the course record, distancing himself from most of his competitors on the bike. He didn’t ride at a higher output, he just went faster for that output. Head over to TrainingPeaks.com/kona for additional coverage from the IRONMAN World Championships. Mat Steinmetz is the founder of www.51-SPEEDSHOP.com, where he and his team of experts help athletes of all abilities in the areas of bike fit, equipment optimization, health analysis, and coaching.